The 2017 Christmas Concert will be held again in the Vatican this year on December 16. 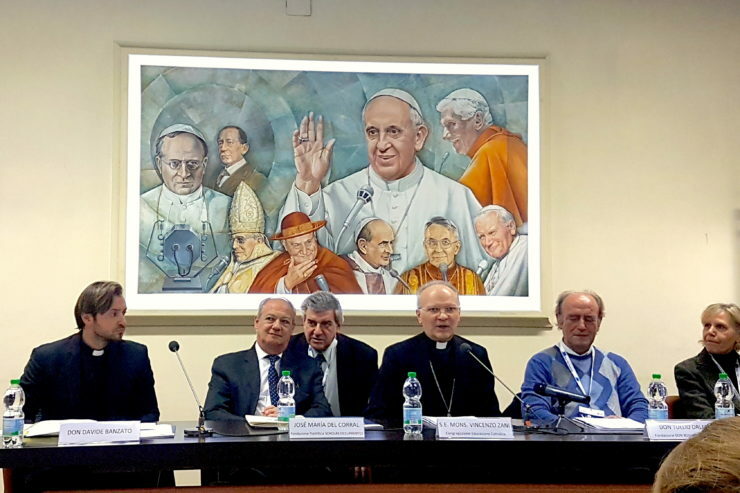 The funds collected will be allocated to educational projects for young people and children: one of the Don Bosco Foundation in the World and another of the organization of pontifical right Scholas Occurrentes. In the presentation event, held on Monday, November 20 in the Marconi Room of Vatican Radio, Jose Maria del Corral, President of Scholas Occurrents, announced that in the first semester of 2018, the first meeting will be held in the Vatican of young people victims of bullying and cyber-bullying, and an Observatory will be established against bullying. Thus a concrete answer is given by supporting these two initiatives, said the Archbishop, because recent <statistics> indicate large numbers of illiteracy in the world, especially to “help each person to become a concrete protagonist,” to build a better world. “Sports, art, technology are Scholas’ working points, and this time, with the Christmas Concert, we are here because of art,” clarified the organization’s Director. Thus Scholas brings together public and private schools of different creeds. Next week in Naples we begin with a project of active citizenship, together with other young people who recently left prison,” he continued. He mentioned that “in the schools, cell phones are removed ‘as if they were weapons’ and, instead, we, parents, give them to them.” What is desired is that parents help them to know how to use them because we have verified “many situations of bullying,” noted del Corral. For his part, Father Tullio Order, President of the Don Bosco Foundation in the World, stressed the correctness with which the funds are used. This year, in particular, there are two projects dedicated to child protection. One project is in India, working to change the tradition that gives girls as brides. The other is in the Democratic Republic of the Congo and neighboring areas, where boys and girls are obliged to work in the mines. This involves some 4,000 people directly or indirectly, he said. And children who leave this work must be given access to instruction. He also pointed out that each kilo of coltan [dull metallic mineral] used for mobile phones results in the death of two children, due to landslides. The aim of the Salesian projects is “to put an end to these sores and to reinsert young people in the society,” concluded Monsignor Zani. Stefania Scorpio, who has promoted the Christmas Concert, explained that in 2006 the Concert ceased being held in Paul VI Hall and that, it will return there next December 6, on the occasion of the 25th anniversary of its establishment.